It’s been shown a few times in the game footage, but this time there will be a function direction along with the various tricks. If the seal is broken, the wall at the top will slowly open. If the weight is placed the counter will sink, then the wall breaks and fly apart. After that a ladder appears step by step from the background, etc. These directions were adopted to decrease the, “I don’t understand why this puzzle was solved” factor which was present in the original version. Even if you use the weight counter nothing happens and, before you know it, the trick where the wall opens from the map separated to multiple screens. After placing the weight counter, a change will happen and if you go to the screen, for the first time it will feel like the wall moves and disappears. “this trick and that wall seem to be connected in some way”. When we started working on the remake of La-Mulana for the Wii, this came to mind when I was watched the whole Indiana Jones series again–to remember that beginner’s spirit. At that time, I noticed in the newest movie that I had not yet seen before, “Kingdom of the Crystal Skull”, that the trick to open the door in the ruins was extremely elaborate. I wanted to have that “sense of pleasure of seeing the trick unravel before your own eyes after you solve it” within La-Mulana. I feel that the latest creation of a series that had greatly influenced me during my childhood being released before the Wii port being decided is like fate. Other than that, with the change to increase the pleasure of this archaeological adventure, if the trick to the treasure chest is solved it becomes half open. After all, people want to open treasure chests near the chest with their own hands. The base of these tricks have been created, and now all that’s left is to think about in what new direction I want to add them to the scene. Turning in to wind and blowing away, or disappearing with the light. Because of our bad habits, these new tricks, such as creating something where the wall moves, makes us think, “let’s crush the player with the Hell Sanctuary”. puzzles are meant to be solved. This is not to be able to express it in an original version. It is thought that it wants you how of seeing the wall painting drawn in the background and reasoning to play. It regarded me by seeing the appearance for Indy to look for beginning while feeling for the wall that it was necessary also for this game. Puzzle game, it dusts by pushing the block, and it exists. 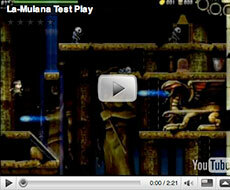 La-Mulana should not be the same puzzle as them. It is necessary to reason, that is, “What the people who made this ruins might make and the idea be made”. However, it is very difficult to express it. “Let’s crush the player with the Hell Sanctuary” makes me nervous in a wonderful way. You know how hard I lughed when I saw the last Indiana movie? La-Mulana was stuck in my head all the time. When he got the skull I was like “Well, you might as well go for Tiamat now!”. Yeah who *wasn’t* reminded of this game (of those that knew about the original) watching the new Indiana Jones? It’ll be interesting to see how this is implemented in-game. These all sound like really excellent ideas, and the changes that you’re making to the puzzle solving are good ones–they’re clarifying the results of the puzzles, making them easier to interpret without making the puzzles themselves easier (at least from what I undestand). Thanks for keeping us updated on this stuff, as a lot of people were concerned about the difficulty and puzzle solving. Are you guys planning on putting in more elaborate, flashy puzzles?